Both CDs are designed to increase understanding of your sacredness as a unique individual, and our connection with one another. 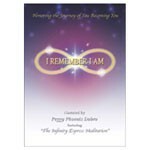 Peggy skillfully combines unique meditations, energetic exercises, and selected readings from her book Elegant Empowerment. This loving offering of practical advice and profound meditations creates an exceptional CD experience. Dedicated to the Creator within YOU! Peggy Phoenix Dubro is a distinguished international speaker and teacher whose diverse talents have gained her a worldwide presence in the arena of "new thinking". Over a period of twenty-two years, she has developed the EMF Balancing Technique®, an elegant and sophisticated form of energy work that is now practiced in more than 70 countries. Documented benefits from working with the EMF sessions include profound peace, stress-reduction, mental clarity, increased vitality and rejuvenation, physical regeneration, greater mastery in one's life, improved relationships and overall well-being. The range of benefits is unlimited as we learn to hold and express our greater charge.